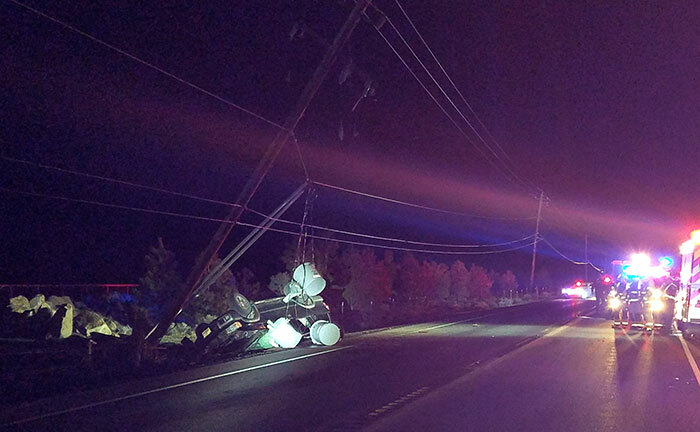 Oregon State Police reported that On emergency personnel responded to the report of a single vehicle rollover crash on Highway 20 near Fryrear Road between Sisters and Bend at about 8 p.m.
Cloverdale Engine 622 personnel found a single vehicle crashed into a power pole, cutting it in two, dangling live wires and three transformers across the vehicle. Preliminary investigation revealed that a black 2001 Nissan Pathfinder, operated by 25-year-old Bend resident Tyler Wright, was traveling eastbound on Highway 20 near Fryrear Road. For unknown reasons, Wright crossed over the oncoming lane and impacted a power pole, the vehicle coming to a rest on its top. Wright sustained fatal injuries and was pronounced dead at the scene. Highway 20 was closed for approximately five hours and power and utilities were knocked out to over 500 local households. Captain Michael Valoppi of the Cloverdale Fire District reminds motorists that, "extra caution and vigilance while driving on the highway is needed when the weather continues to change throughout the day. This can create hazardous conditions on road surfaces, especially in curves at highway speed."